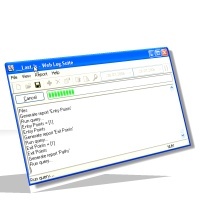 Web Log Suite is a GUI/command line powerful web server log analyzer. Highly detailed and easily configurable reports can be generated in various languages output to screen, ftp, file directories or e-mail. Web Log Suite can analyze more than 43 log file formats. It was tested with all popular web servers (Apache, IIS etc. ), proxy servers, firewalls and MS Windows Media Services. Needless to say, it can recognize log file formats automatically, extract compressed log files, process multiple log files and download log files from various sources: Web, FTP. ODBC compliant databases, etc. Support for UTF-8 HTML has been introduced. Now the HTML reports are created in UTF-8. Referring Categories report bug fixed. Fixed some crash parsing problems. Summary Log Files Info window improvements. Minor improvements compression and decompression. You're welcome to submit any questions, suggestions and comments about Web Log Suite! Please let us know what you would like to see in the future versions here please.